Home / News & Blog / It Works. John McDermid is looking forward to the summer days ahead. 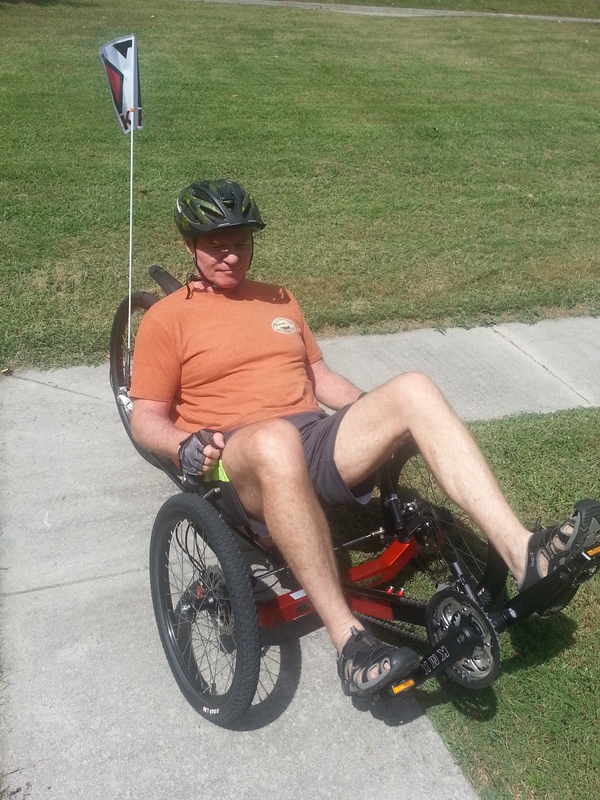 He has big plans for his new recumbent trike. “Plans are to ride every weekend on the trails around the area, if possible,” says McDermid, 57, who lives in Jefferson County, and works in Hamblen County. The recumbent trike is a multi-terrain vehicle McDermid can use on or off road, with an adjustable seat, rear wheel drive, and front two-wheel steering. survivor who, just a few years ago, could barely walk. Therapy at Patricia Neal Rehabilitation Center helped him get back on the road. McDermid was at first misdiagnosed as having vertigo, then further symptoms were misdiagnosed as being related to the medication he’d been given. On October 14, he lost all use of his limbs, and his wife called 9-1-1 for an ambulance to rush him to Knoxville. The final diagnosis was vertebral artery occlusion with dissection, and stenosis of the basilar artery. Surgery was deemed too risky, so McDermid spent three weeks in the hospital’s critical care unit. The whole experience caught McDermid off guard, because he never suspected he was at risk for a stroke. Reviewing his risk factors at the time, there weren’t many to count. He’d dealt with a bit of hypertension, and there had been some family history of heart disease, but on the whole, McDermid had been doing all the right things to stay healthy. It was a different person who checked out of the hospital in November of 2014. John McDermid, very active and seemingly in good health just a month earlier, now required assistance to accomplish daily tasks. Therapy took McDermid from the wheelchair to a walker, and from the walker to a cane. He was also challenged to master leg exercises, and walking on stairs. An occupational therapist worked on his fine motor skills like tying his shoe laces, getting dressed, and working with his hands. “Speech therapy was by far the most challenging,” McDermid says, “but rewarding.” The speech therapy consisted of cognizant therapy, problem solving, multitasking, reading, and writing. Two weeks later he was released to outpatient therapy closer to home. “Wow, there was a huge transformation,” he marvels. Faith, family, and friends gave McDermid the homegrown support and encouragement he needed to heal, and return to his life back home. PNRC gave him the tools to get there. Stroke is the fourth leading cause of death and a leading cause of serious, long-term adult disability. To learn how Patricia Neal Rehabilitation Center is helping stroke survivors get their lives back, visit www.patneal.org, or call 1-800-PAT-NEAL (728-6325).